Passed Away - July 2018 Old Age - Thank you for 13 wonderful Years! Sheila: In 2005, at the recommendation of a friend, we decided to buy my first golden retriever. Sheila turned my heart and taught me about how balanced and trainable this amazing breed is. She is so loyal and has provided many wonderful memories. A trip to the Wind Rivers in 2011 resulted in a cranial cruciate ligament tear. She was chasing off a coyote in the night while we slept in our tent. It’s a shame they have to start getting old. She is our best natural and very savvy upland hunting dog. She comes from a line of western breed upland & water fowl hunting dogs. I meet and witnessed first hand what her mother could do. That's when I got really interested in Golden Retrievers. We placed a deposit and the journey began for us. 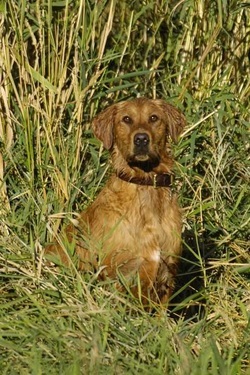 From a healthy litter of 11, she’s a retrieving machine with confidence on land and especially in water. A strong family trait evidenced in her progeny. Sheila possesses what we think is a main component in the hunter’s dog, cooperative behavior. Which makes working with her in the field an absolute pleasure.